Androstenedione is synthesized in the adrenal gland. It is the primary precursor of testosterone in women. Therefore, in women, androstenedione contributes significantly to the level of androgenic activity, while in men this contribution is nil. Quantitation of androstenedione may indicate the androgenic activity in women. 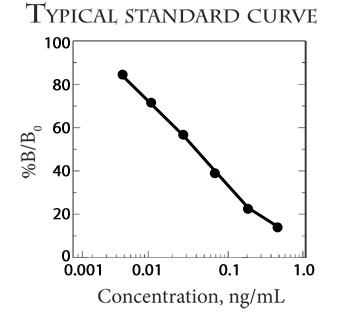 This is an ELISA for the quantitative analysis of Androstenedione levels in biological fluid. This test kit operates on the basis of competition between the hormone conjugate and the Androstenedione in the sample for a limited number of binding sites on the antibody coated plate. The sample or standard solution is first added to the microplate. Next, the diluted hormone conjugate is added and the mixture is shaken and incubated at room temperature for one hour. During the incubation, competition for binding sites is taking place. The plate is then washed removing all the unbound material. The bound hormone conjugate is detected by the addition of substrate which generates an optimal color after 30 minutes. Quantitative test results may be obtained by measuring and comparing the absorbance reading of the wells of the samples against the standards with a microplate reader at 450nm or 650nm. The extent of color development is inversely proportional to the amount of Androstenedione in the sample or standard. For example, the absence of Androstenedione in the sample will result in a bright blue color, whereas the presence of Androstenedione will result in decreased or no color development.